NASCAR issued penalties to two NASCAR Camping World Truck Series teams as a result of rules violations during the Texas Motor Speedway race weekend that included the Jag Metals 350 Truck Series race on Nov. 3, according to NASCAR’s weekly penalty report that was released Tuesday. Kevin Bellicourt, crew chief on the No. 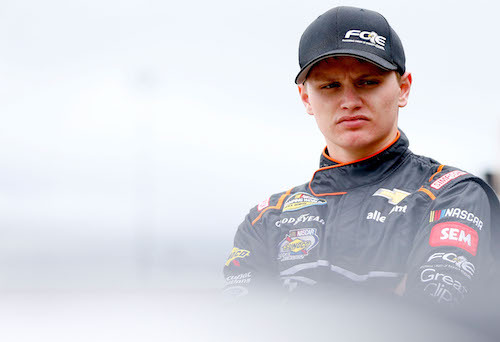 24 GMS Racing Chevrolet team of driver Justin Haley was suspended for one Truck Series race and fined $5,000, because the front and rear of the truck failed to meet minimum height requirements in post-race inspection at Texas. As a result of the infraction, Haley and the race team also were docked 10 driver and owner points. Ryan Fugle, crew chief on the No. 4 Kyle Busch Motorsports Toyota team of Christopher Bell, was fined $2,500, because the No. 4 truck had a lug nut missing or loose at the end of last Friday night’s race. The Monster Energy NASCAR Cup Series and NASCAR Xfinity Series also raced at Texas Motor Speedway last weekends, but no penalties were issued for teams in those series.